There are many different types of arthritis. Osteoarthritis is also known as degenerative joint disease or degenerative arthritis. 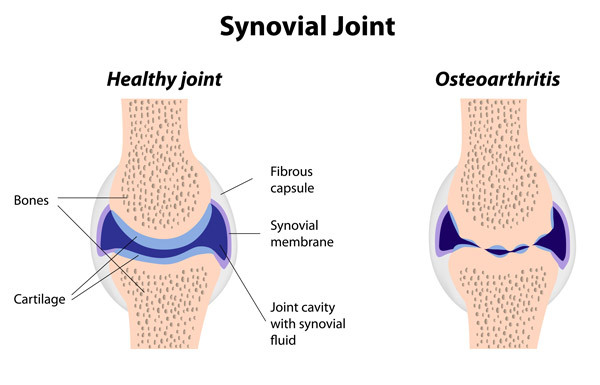 It is a chronic condition characterised by the breakdown of cartilage within the joint. The cartilage is a rubbery substance that covers the end of the bones, which is responsible for cushioning the joints, acting as a shock absorber and providing a smooth surface so that the bones can glide in a smooth motion. When the cartilage breaks down, it creates a rough surface and so the movement within the joint becomes less smooth. The cartilage thins, swelling occurs inside and around the joint, and sometimes bony spurs or osteophytes can grow on the ends of the bones. A grinding or creaking sensation (crepitus). The symptoms can vary and for no clear reason, some people notice that it can be dependent on their activity levels, diet or even the weather. Osteoarthritis can affect any person at any age, but it becomes much more common as we age. It can affect any joint in the body, the most commonly affected joints are the hips, knees, spine and hands. Common risk factors include obesity, excessive stresses on the joints, previous injury, joint deformities, weakened muscles and also genetics. Osteopathy may be useful in addressing any of the above areas. By assessing the entire body, we can determine where the stresses and strains are and how having osteoarthritis can also affect the rest of the body. Osteopaths can treat the muscles and joints so that the body is functioning as well as possible. We can also give exercise advice on how to strengthen the affected muscles and which types of exercise will be best for you, allowing you to live an active and healthy lifestyle.